This is a chemistry colloquium day, but we decided to make this colloquium a little different. 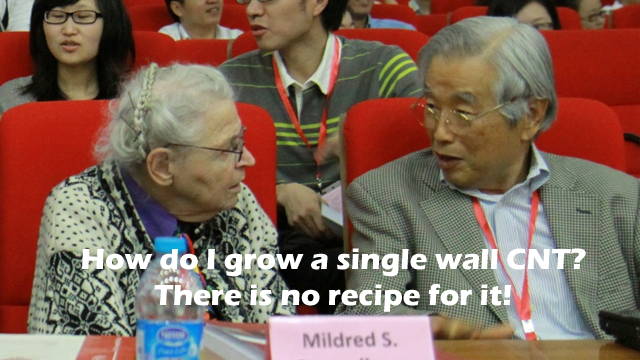 We decided to pay tribute to the late Professor Millie Dresselhaus from MIT. Professor Dresselhaus was a distinguished scientist and today, people call her the ‘Queen of Carbon’. 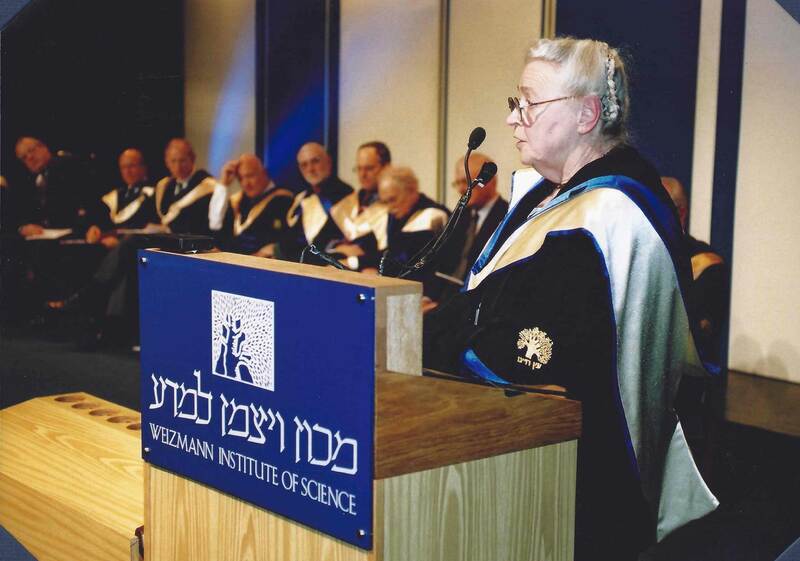 Professor Dresselhaus had a major influence not only on scientists in the US, but also on many Israelis, including myself and Ernesto Joselevich and others — such as Didi Frein and Rafi Kalish at the Technion and many more. She was also an important visitor at the Weizmann Institute. 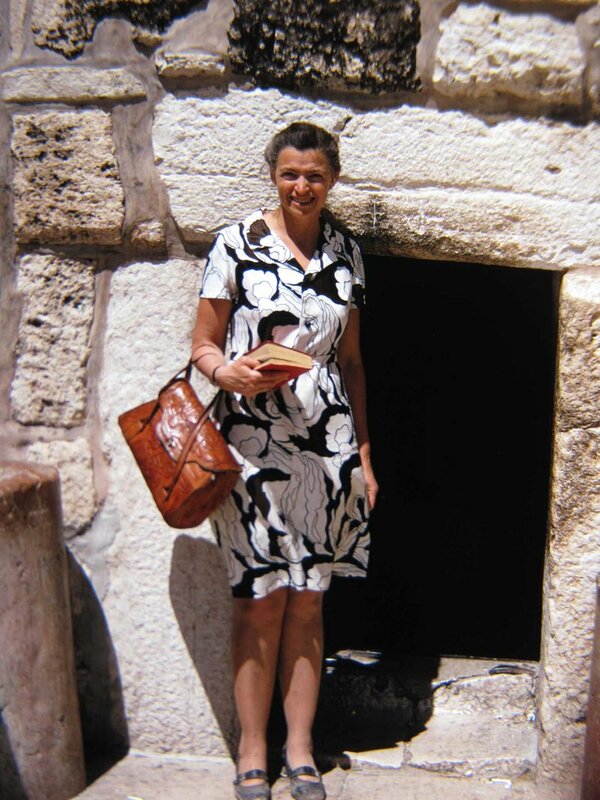 She was on the Weizmann Board of Directors for many years, and took many trips to Israel. 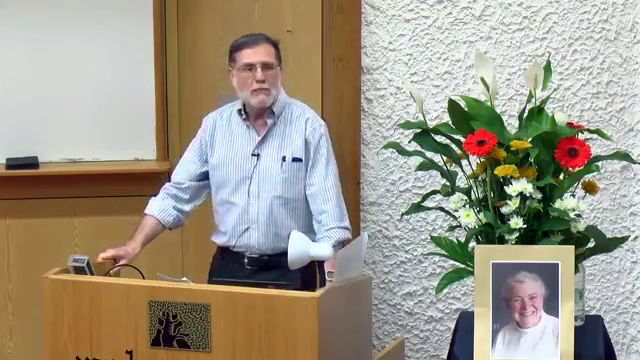 For this memorial, we will do the following: first, Shmuel Safran, who was a student of Millie Dresselhaus, will speak of her scientific history. Shmuel was a student in her group, and he worked in close collaboration with her during his early PhD and postdoc. And then I will introduce our distinguished speaker today, Professor Sumio Iijima, who also had a lot of interactions with Millie over the years. He will talk and show pictures from the event three days ago in Philadelphia. So please enjoy. 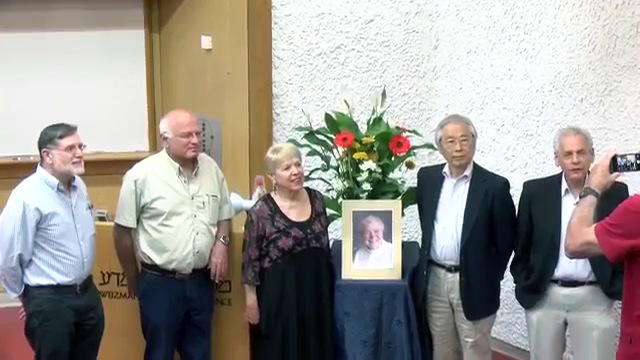 It's an honor to be to be asked to say a few words in memory of late Millie Dresselhaus from MIT. I knew Millie in my student days — we had a mutual mentor, my official PhD mentor and Millie's mentor while she was at Lincoln labs, Professor Ben Lax, who was head of the national magnet lab where Millie's research group had their lab at the time. 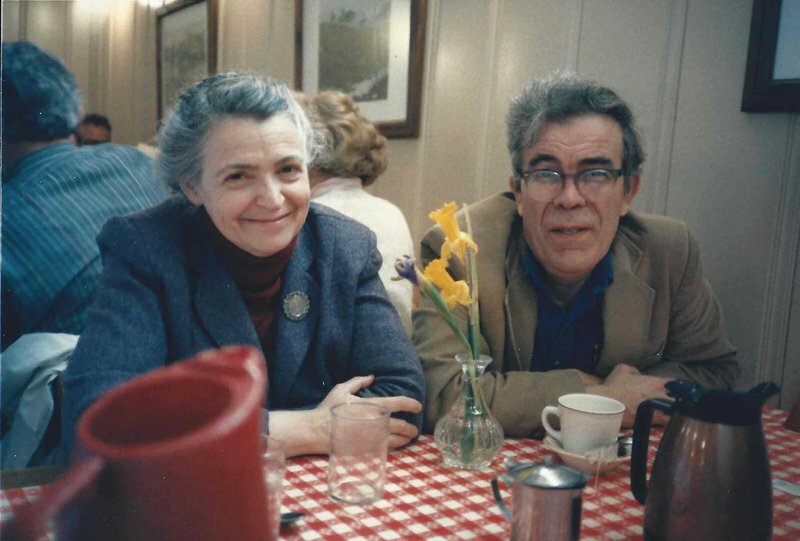 Her husband, Gene, was a theorist — a research scientist — at the magnet lab. My thesis work was a theoretical analysis, done together with Gene, of experiments done in Millie's group on phonon magnon coupling as evidenced in very anomalous magnetic phase dependence scattering in magnetic semiconductors. Towards the end of my stay at MIT, I was inspired by the experimental findings in Millie's group on graphite intercalation compounds — that's where you put atoms in between the layers of graphite — and this topic was the basis of my theoretical postdoctoral research, most of which was done at their labs. Since then, our scientific paths diverged — hers in the ordered world of solid materials, and mine in the disordered world of soft and biological matter — but we still kept in touch. I want to now share with you a few of Millie's recollections of her life and career in her own words. By the way, Millie’s brother was actually an engineer at the Weizmann Institute. Millie, I should add, was also a violin player. When Millie first entered college, by the way, she thought she would become a schoolteacher. Millie had worked on superconductivity in her thesis. At Lincoln Labs, Millie was asked to work in the newly emerging field of magneto-optics and to work on semimetals (of which carbon is one example), since other workers in magneto-optics were strongly focused on studying semiconductors. 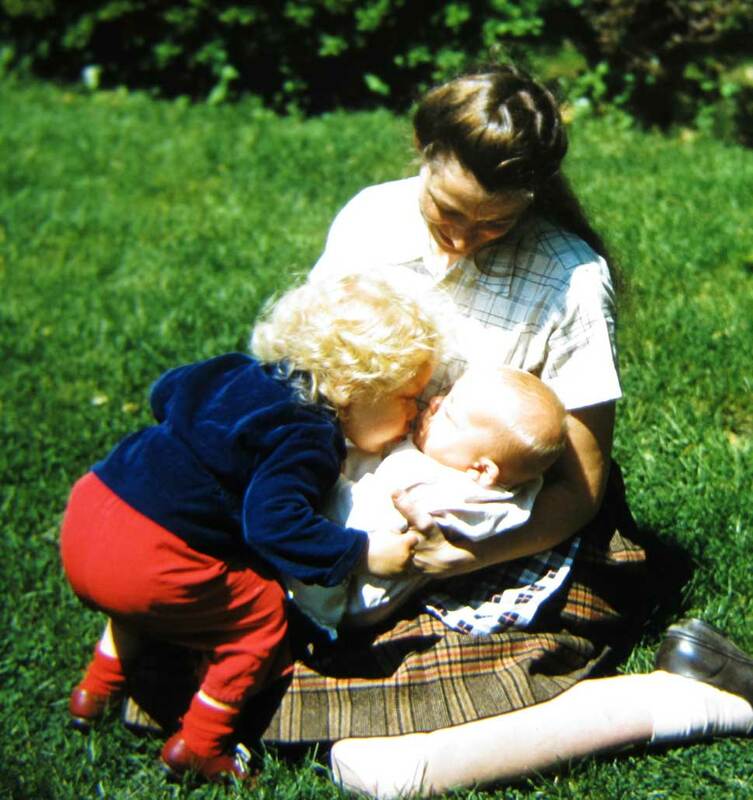 Over six years, Millie and Gene had four children. 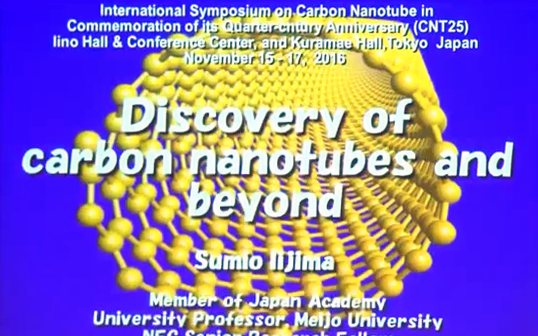 Millie’s early work in bulk carbon paved the way for her more recent advances in carbon nanotubes, as you will hear later on from our distinguished speaker, Sumio Iijima, and also our chair, Reshef, who is also very distinguished. 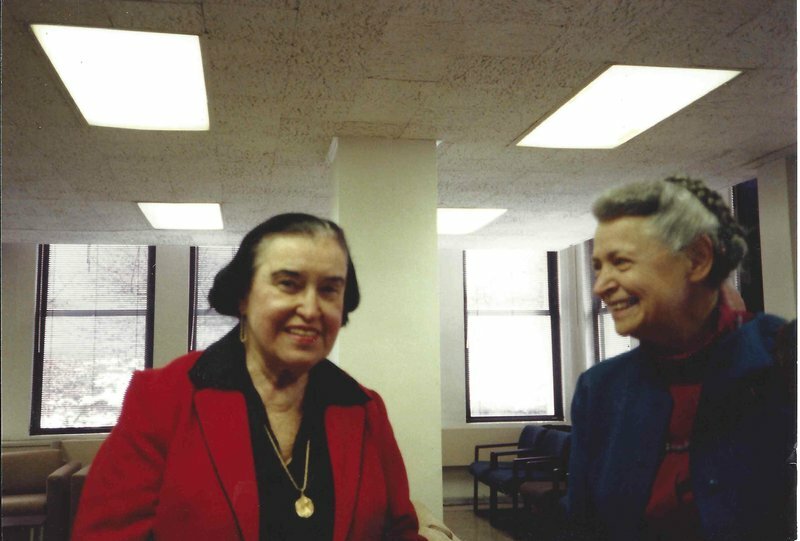 But first, I should mention that Millie left Lincoln Labs and made the transition to becoming a professor at MIT in 1967. 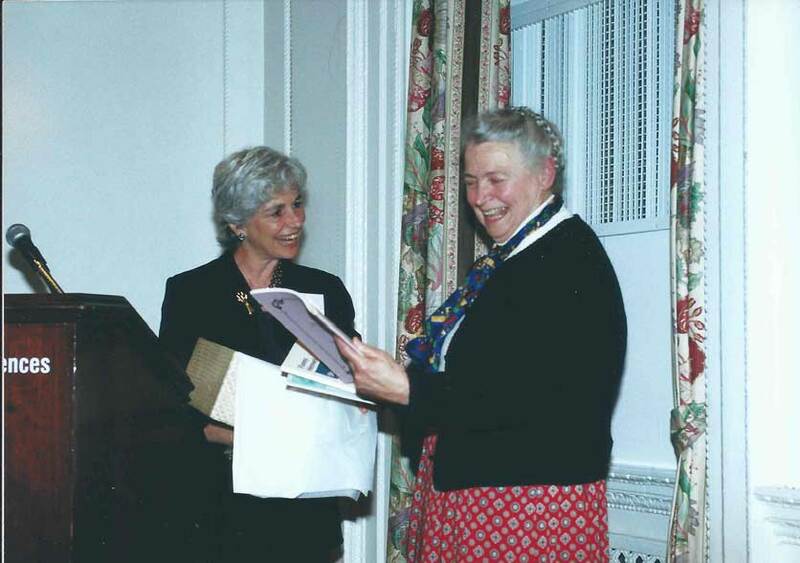 This put her in even more contact with students — and their guidance and education was always very, very dear to her heart. In 1973, Millie moved from studying bulk carbon to entering the nano world, as she began to work on intercalation compounds. The staging effect — which is where you can intercalate in one layer, and then have five, or six, or seven, or even ten empty layers above that — made it possible to synthesize graphene intercalation super lattices, in which the intercalate layer was a single layer of a gas species. 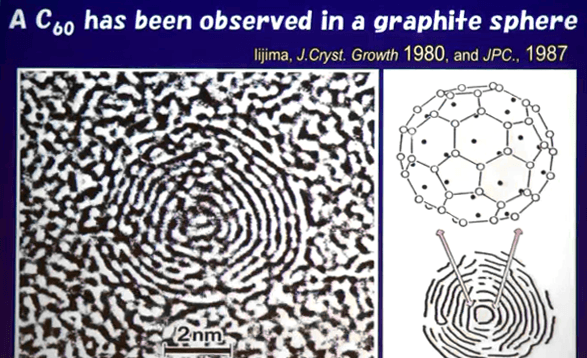 This early work in the 1970’s showed that the behavior of monolayer graphene (which is one layer of carbon atoms) was different from all the others. This resulted in a highly cited review article on graphite intercalation compounds in 1981, which is still important today. 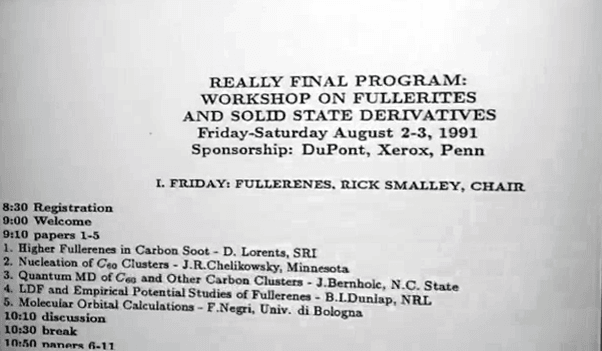 At a Department of Defense sponsored conference in December of 1990 in Washington DC, Richard Smalley was invited to speak on fullerenes and Millie was invited to speak on carbon fibers. In an ensuing question period they were asked about the connection between fullerenes and carbon-fibers. 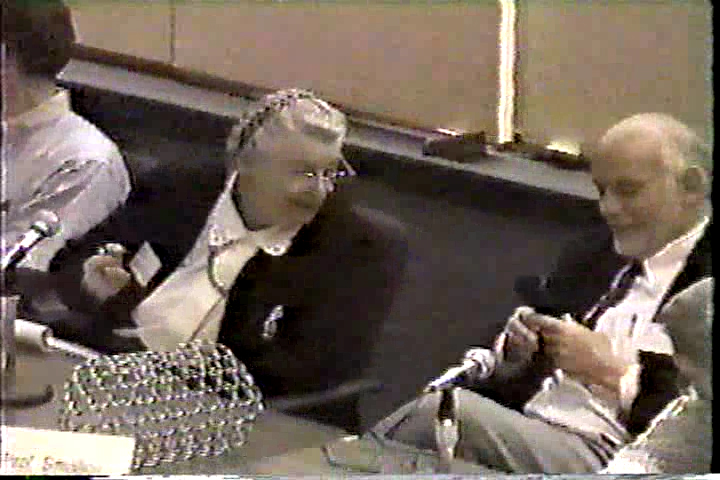 Since both of them were knowledgeable about each other's work, they explained that if one elongates C60, a buckyball, along an axis going through a hexagonal phase, one can get C70 and continue to C80 and eventually get what’s now called a single walled carbon nanotube. This resulted in calculations by the Dresselhaus group that showed that such single walled tubes could be either semiconducting or metallic, depending on the orientation of the hexagons relative to the tube axis. I'm going to stop now, since these areas are going to be covered by our later speakers, and since they are the expertise of our chair and our speaker. It’s a great pleasure to host Professor Sumio Iijima from Meijo University in Japan, and formerly from NEC Japan, to talk a little about Millie’s work, and then to talk about his work on carbon nanotubes — which is an exciting field of science and technology. 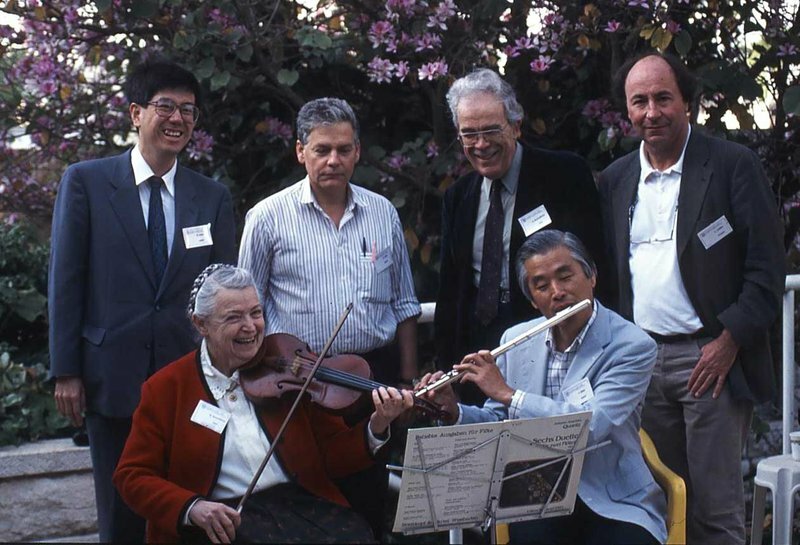 I will start by saying that about 20-30 years ago, I went to one of the early carbon nanotube conferences, and Millie and Sumio were invited to play a duet! So Millie played her violin and Sumio played his flute. I’m not sure that he brought his flute with him today, but he was known to do it sometimes, because they played together at least two more times (if not more). The interaction between the two was, as he will describe, amazing. Sumio Iijima started his career in Japan, and then he moved to the US to John Cowley’s lab at Arizona State University. At the time (roughly 40 years ago), this was the foremost electron microscopy lab in the US — and, in fact, that university now has a John M. Cowley Center for High Resolution Electron Microscopy, named for this same John Cowley. 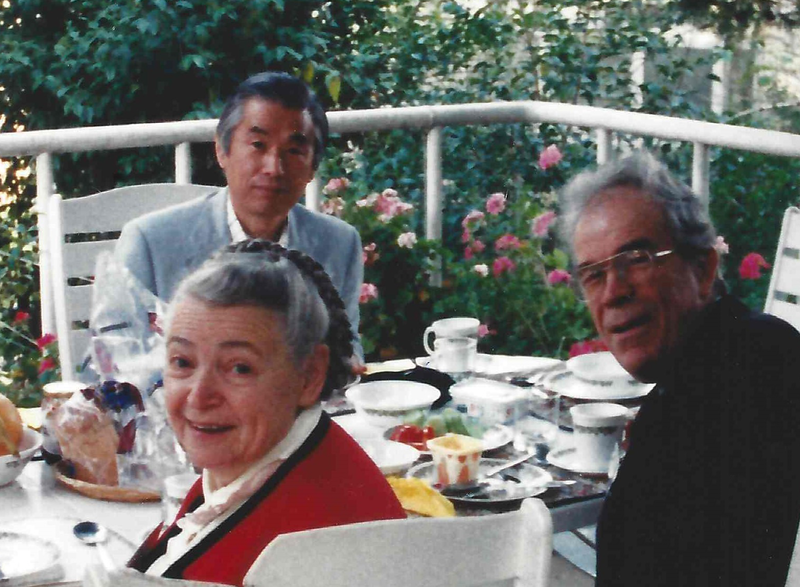 John Cowley basically established the school of electron microscopy in the US, and Sumio was one of his most outstanding students. 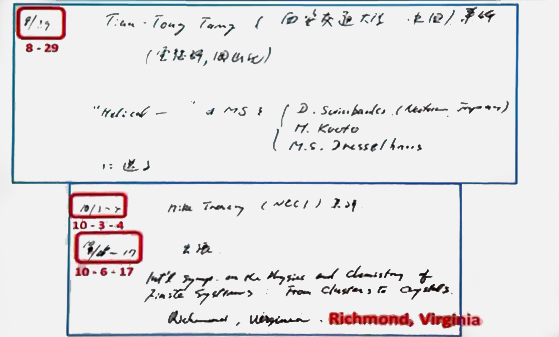 When Sumio joined the school in 1970, he started to study oxides of tungsten niobium and other transitional metal compounds, and he was able certain to see, first-hand, the shear planes and describe the phenomena of shearing nonstoichiometry in oxides. He was the first person to see single atom of niobium (or tungsten) and other layered compounds, which he then studied in this environment. This was already a remarkable achievement at that time and having a high resolution of that quality was extremely important. He was then invited by NEC to return to Japan and start his career there. When he arrived, he was asked to study — among other things — carbon nanoparticles. One of his early papers on carbon fullerenes was a really exemplary paper in which he described how carbon fullerenes are formed by the collection or assembly of a network of graphitized hexagons and 12 pentagons. I guess he will show us this paper today. This paper was published in 1980 in an obscure journal called the Journal of Crystal Growth. I’m not sure how many times it’s been cited, but it’s certainly a very, very important paper. In fact, it was one of the early papers that I read when I started my own career in this field. 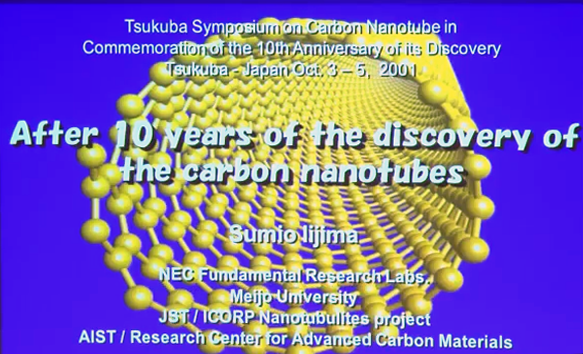 Anyhow, Sumio Iijima continued to work on carbon nanostructures, and — of course — made the great discovery of carbon nanotubes in 1991. I don’t have to explain how important this discovery is — it’s been cited more than 40,000 times. 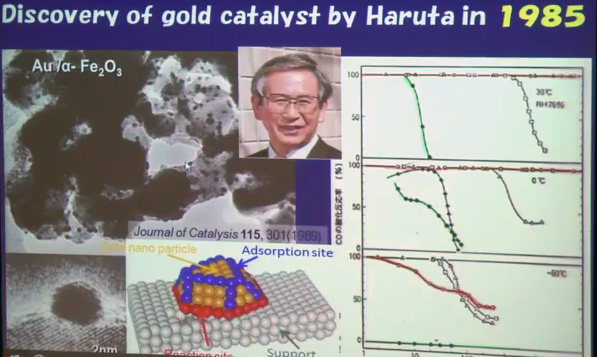 He has since written many other important papers, including one highly cited paper describing single walled carbon nanotubes, which published two years later in Nature with Ichihashi. And in the middle, between these two papers, Millie Dresselhaus with a Japanese group — and then few other Japanese groups — published their seminal paper on how carbon nanotubes can be either semiconductors or metals, depending on how they are cut. And that immediately ignited a world interest in carbon nanotubes. 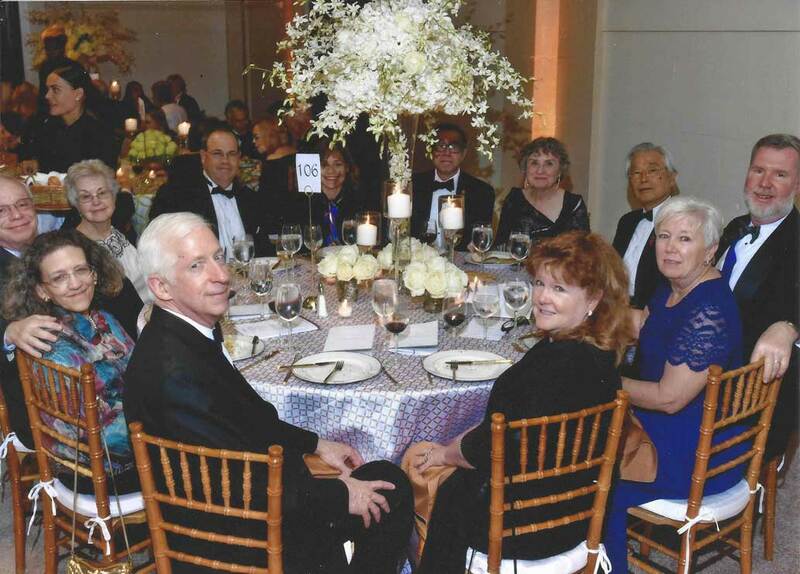 It’s no surprise that that Sumio Iijima was recognized for his discovery by many awards and accolades. 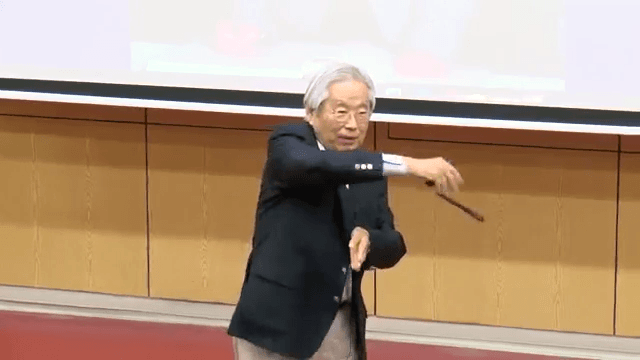 He is, of course, a member of the Japanese Academy of Sciences, which is probably the most selective Academy of Sciences in the world. He received the inaugural Kavli prize with Louis Brus in 2008. 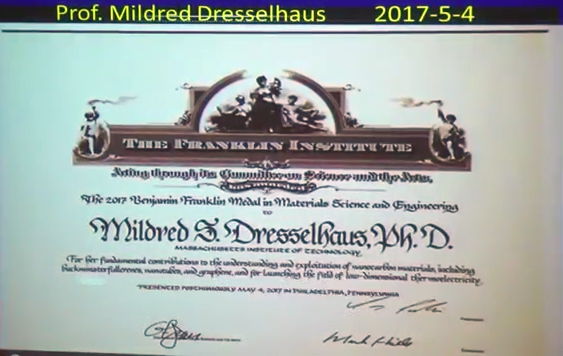 And I think he will actually show us a picture of himself at the Kavli Awards with Millie Dresselhaus, who received it in 2012. And he’s received many, many other awards including the New Materials Award of the American Physical Society, the Franklin Medal (which we will describe soon, as well). 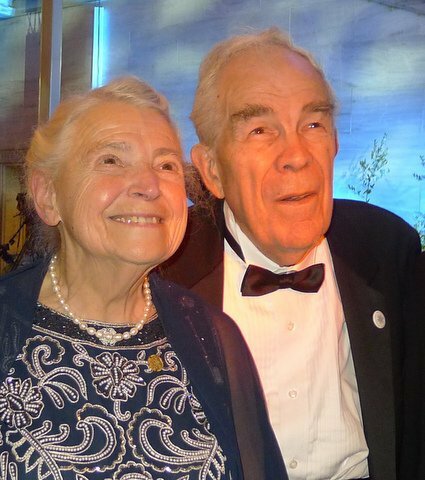 I’ll just mention that three days ago, the Franklin medal was awarded to two distinguished scientists whom we know very well — the late Millie Dresselhaus and Marvin Cohen. Marvin Cohen is a member of the board of the Weizmann Institute, and he comes here annually with his wife. Sumio took few pictures from this ceremony, and I think will all enjoy seeing those. 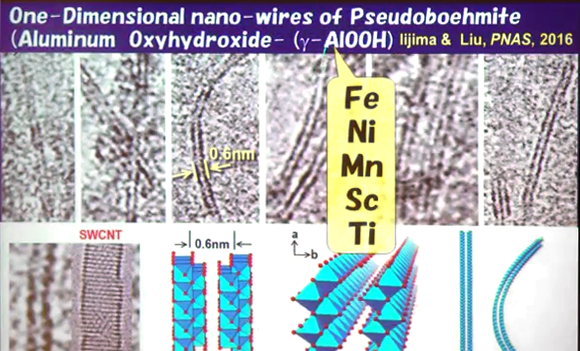 Since his breakthrough with carbon nanotubes, Sumio has educated generations of high quality electron microscopy. I’ll just mention Kazu Suenaga, with whom I interact from time to time. 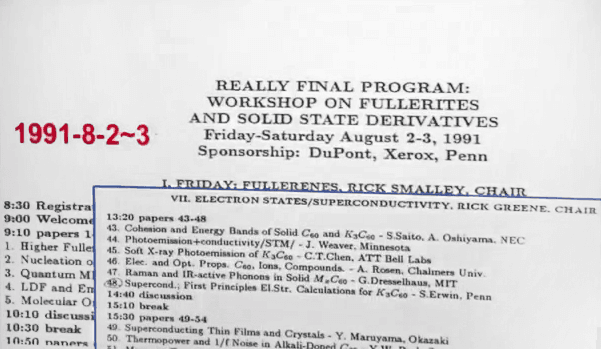 I’ll also mention one other fact — in 1994, we interacted with Sumio Iijima because we discovered the molybdenum and tungsten disulfide nanotubes that Yishai Feldman synthesized, and the late Lev Margulis traveled to Japan to work with Sumio for one month. Unfortunately, when he came back, he became sick — but we were able to write one joint paper on these molybdenum disulfide nanotubes. Since then, I have met with Sumio many times in Japan, Europe, the US, and Israel. The last time he was here was a few years ago when we had a China-Israel meeting, and he was the distinguished speaker. We are looking forward to hearing Sumio’s talk, and we thank him for giving this memorial lecture. Good morning. My name is Sumio Iijima. Thank you very much for your very kind and very detailed introduction, Reshef. Probably, I’m not the right person to give a speech on Millie, because I wasn’t directly her student — in fact, I was sort of in competition with her at various times. But we still wound up with a very nice sort of collaboration. We have this very nice carbon community, so she and I met a lot at conferences, and we would often both give talks at the same events. Before coming to Weizmann, just four days ago, I was in Philadelphia — and I’ll briefly explain why. 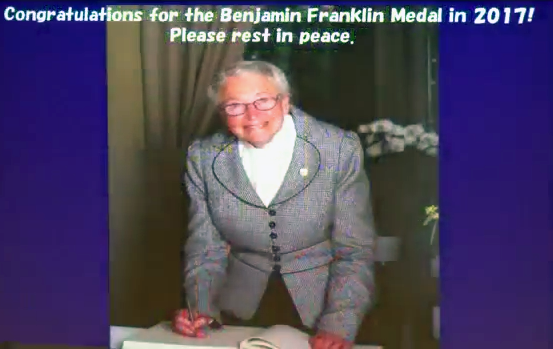 Millie was supposed to receive the Franklin Medal in materials sciences and engineering in 2017, but she passed away before the ceremony. So the Franklin Institute arranged to have a symposium for her before the medal award ceremony. Prof. Marvin Cohen also received a Franklin Medal in Physics. He’s from the UC Berkeley physics department, and he was also very important. So you can see that this made for a very nice symposium in Philadelphia. I’d like to start my talk with some pictures. 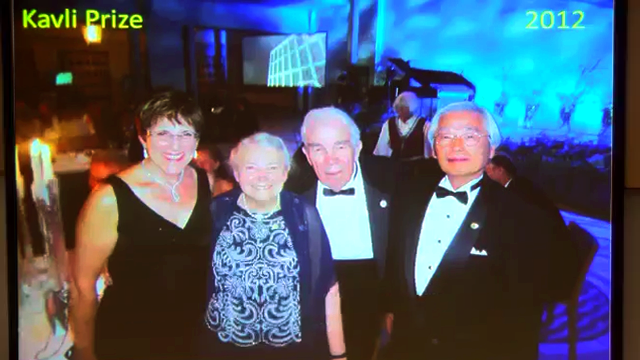 This was in 2012, when Millie received the Kavli prize in nanoscience. I was invited to Oslo to join the celebration. This was taken a few days ago in Philadelphia. 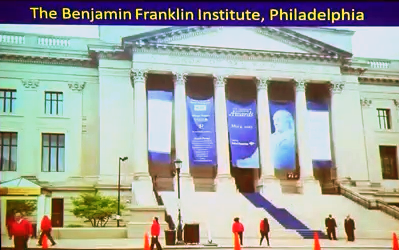 This is the Franklin Institute where the ceremony was held. 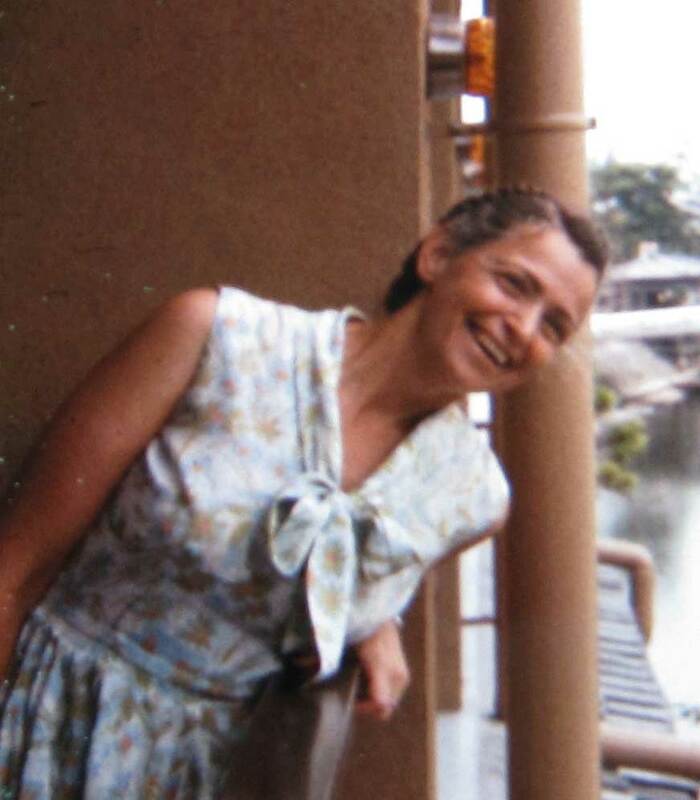 This beautiful lady is Elizabeth Dresselhaus, also a scientist, who is one of Millie Dresselhaus’ five grandchildren. 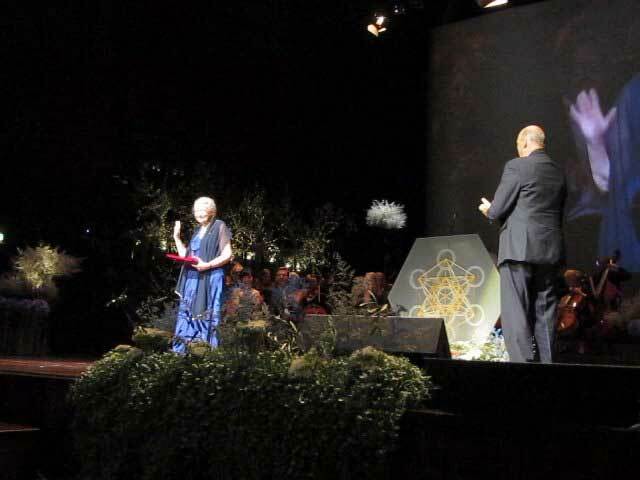 She graduated from the University of Pennsylvania — which is right in the Franklin Institute — so she came there to receive the medal on Millie’s behalf. Above, you can see her holding Millie’s Franklin Medal in Materials Science and Engineering. Going back to the Kavli Prize ceremony in Oslo, this is Millie and Gene together. This is at the celebration reception. To sum this up, I always think of Millie as the mother of the carbon community. We have been collaborating or influencing each other in some way for last 20-25 years. I have a few more slides. 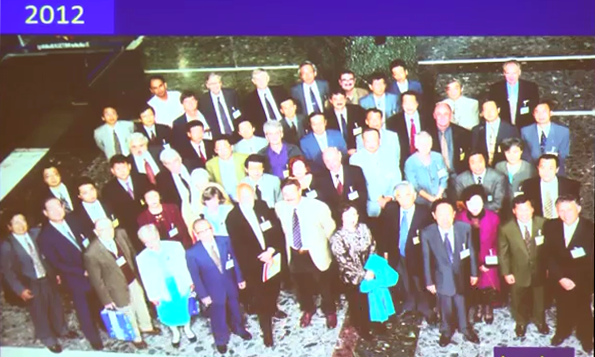 In the carbon community, back in 2001, we held a workshop to memorialize “10 years after the discovery of carbon nanotubes.” Of course, we invited both of them to Tokyo for this event — below, you can see a group photo. You can see Rick Smalley is there, and you can, of course, see Millie and Gene. We all had a very good time at that conference. It was inevitable that we would, given that there were so many of the active carbon scientists from around the world, all gathered together in one place at one time. That is enough to inspire anybody. I’d now like to describe about a little bit about the background of my discovery of carbon nanotubes. I have to start with the photograph above. 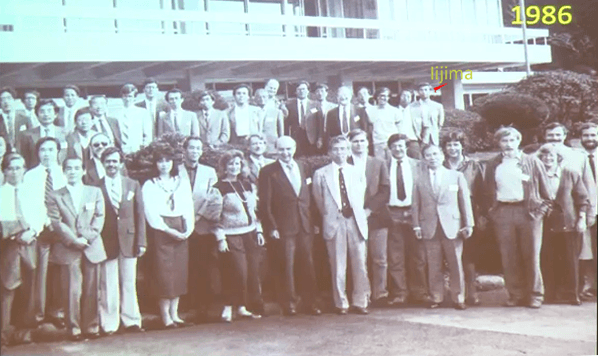 This was taken in 1986, and if you look carefully, you can see a young Iijima standing up in the very, very back right. 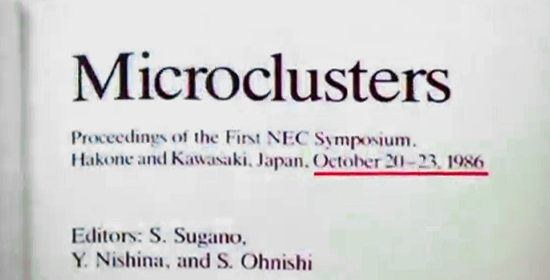 This was about the time I came back from the United States, whereupon I attended a symposium on microclusters in Hakone and Kawasaki. Here’s a book I wrote on microclusters. Interestingly, at that time, we didn't have the word ‘nanoclusters’, we had to stick with the word microclusters. They both mean the same thing — ultra-fine particles. 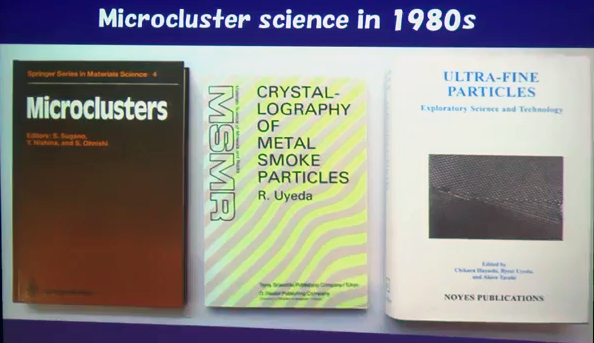 But the word ‘nanocluster’ was still in the future. At this time, Millie was also working on clusters… sort of. She was trying to measure the melting temperature of diamond, but noticed her clothes getting very dirty. She didn’t know why, but thought it had something to do with carbon clusters. So she got interested in that. Here is some more of my own background, which led me to my discovery of carbon nanotubes. 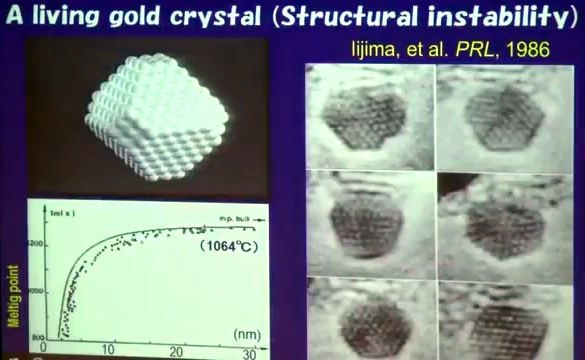 This is a small gold cluster — a gold nanoparticle. By the way, this research is from 1986, so these are very old pictures, but you can see that I was shooting certain kinds of nanoclusters under an electron microscope. I created a video from those early pictures (shown on the right). It’s interesting, because they’re moving — but not physically moving. It’s the internal atoms that are the real engine! This is what happens under electron beam radiation. On the right side of the slide above is a series of images. The top images are twinning, the middle ones show the hexahedron phase, and the bottom ones show a simple cube or octahedron. So you can see that this is changing all the time, and we called this the ‘structural instability’ that takes place under the electron beam. Actually, this research I did on the gold particle is now a hot subject, and many people have started working on it, again! But at that time, not so much. This is Professor Haruta. He was the first the discoverer of the gold catalyst. I was working with him at that time. Behind him, on the left, you can see the pictures I took of the gold particle sitting on the oxide. I mention this partly because it explains my background, and partly because I think people should know this, because many people are still talking about this process and coming up with discoveries about it. This is my motivation for coming into carbon science. 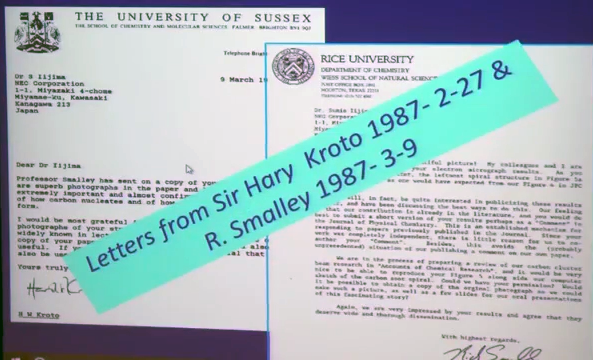 These are two letters from two Nobel Laureates — of course, they hadn’t won it at that time — namely, Harry Kroto and Rick Smalley. These letters were sent to me in 1987. Remember that discovery of carbon C60, AKA the fullerene, occurred in 1985, so they sent me this letter only two years later. They expressed great interest in my work, and even came to Japan to meet me! Why? Well, I’ve missed a bit of the story. So now, I will go back and explain to you why they came to meet me, and what they were so interested in. So you can see that they had a reasonable idea of this closed structure, but they did not have enough data to thoroughly prove that this was a closed structure. As Millie said, their proposed model was just a postulation — it was just a guess. They were guessing that the structure of C60 was like a soccerball! Therefore, when they published their first paper in 1985, not many people believed their discovery. There was only one course of action: they knew they had to discover some solid evidence that would support their conclusion. That’s how they came to me. I don’t know if you recall, but Reshef mentioned this graphite onion structure in the introduction. I published this photo in 1980, when I was in Arizona. Look at the central region in the middle of my picture — it looks about the same as C60! You can see that it has a similar spherical graphitic structure, just like C60. So they saw this and realized it was very nice evidence to support their discovery. That’s why they came to me in Tokyo. In other words, in my earlier paper, I described these structures in great detail, but I didn’t really have this soccerball model, yet. If I had been aware of this structure back in 1980, maybe I would have gotten the prize before them. But I missed it! Anyway, to create C60, we need both pentagonal rings and also hexagons. On the figure, you can see the p is for pentagon, to describe this spherical graphitic structure. So you can see that I was very close to the fullerene structures, already, at that time. For the microscopist, high-resolution microscopy was a new and exciting thing that began in the 1970’s. They used this as the testing material for their shots. This is a glassy carbon. This was very helpful to people in those days, because they could tune their microscope to make sure they could see those nice lattice fringes. So this was a very familiar image to all of us. On the upper right, you can see the graphitic structures. If you look right there in the red circle, you can see three layers — that’s not a double layer graphitic structure, but a triple layer. That’s why, when I saw this graphitic onion structure, I immediately thought about what the graphitic structure really was like. This is us happy together. Although the discovery was made in 1985, this picture was taken later — probably around 1995. Millie knew these people, too, of course. She worked very closely with Rick Smalley. All these people know each other. Like I said before, the carbon community is a very nice community. 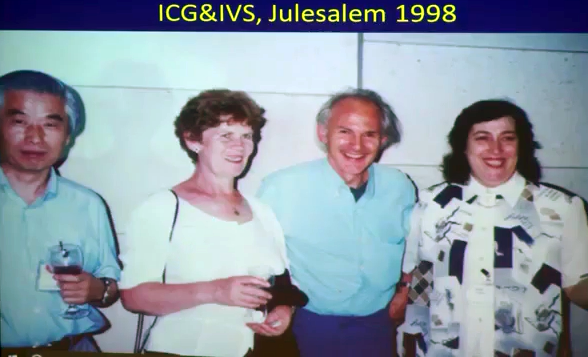 Reshef mentioned about how Millie and Kroto came to Israel to participate in the fullerene international conference. Here is a picture from that time. Harry Kroto, by the way, passed away last year. But all of us in the fullerene community have a real connection to this country. Alright, so this is my message. My point to make here. 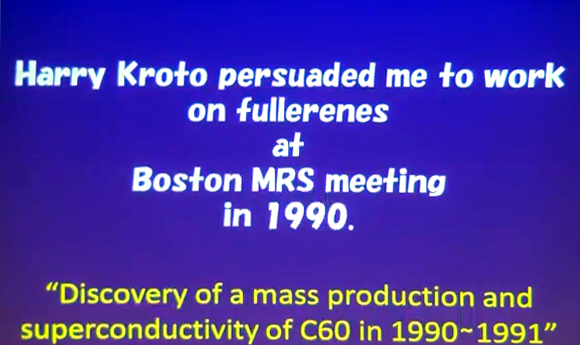 Harry Kroto persuaded me to work on fullerenes at the Boston MRS meeting in 1990. Before that, as I’ve said, I was already well acquainted with these two guys, and in this year — probably young scientists don't know what was going on in this year — there was a discovery of mass production of C60 and of superconductivity in C60. Everybody was very excited about this discovery! In the Boston MRS meeting, the sessions went all the way to midnight! So everybody was very excited discussing this. I was there, attending the conference, but I hadn’t started working on carbon, yet. I had been doing some diamond film research. But I went to the Boston meeting in the carbon fullerene sessions. 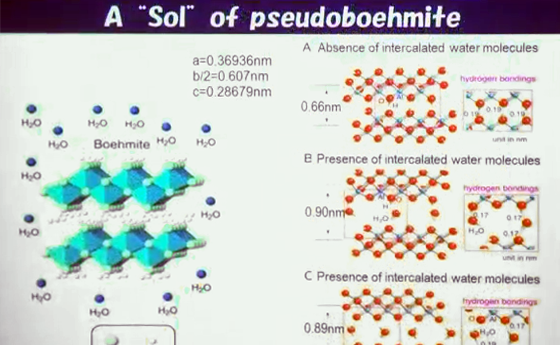 I met with Kroto, and he told me, “Sumio, you should do work on carbon fullerenes!” I took his advice, and after I came back from Boston, I immediately started to research this carbon material. That’s how I started in carbon. A little bit more of the details. I met with Harry in 1990 at MRS in Boston. Immediately afterward, I started to research carbon materials, and 7 months later, I had… sorry, these are my notes in Japanese… I had some data that the carbon might have some chiral structures. 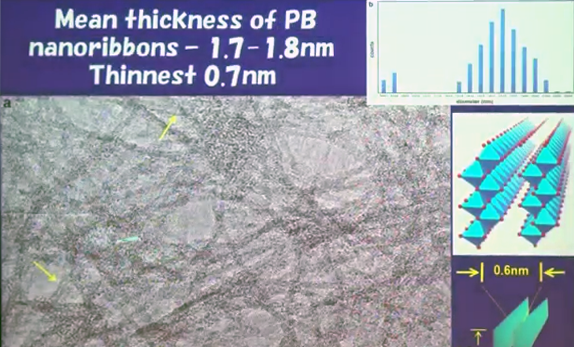 Then in August 22, I submitted a paper to Nature entitled “Helical Micro-imbules of Graphitic Carbon”. That was published in November, 1990. These are the pictures, right after I came back from Boston. And I saw exactly same the structures in all of them… just like this one. See these blobs? They’re everywhere. They had this onion type of structure. However, I also saw these very fine, needle-like structures, and they were also everywhere. So I was primarily looking for these onion structures, but then I noticed the needle-like structures and was very keen to know what they were. I immediately jumped on this material and started to examine it. This is how I discovered carbon nanotubes. 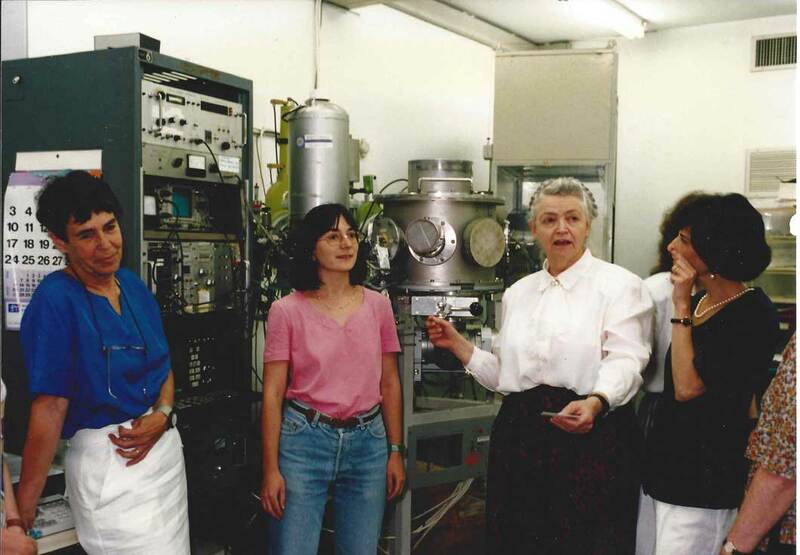 So by August 29, 1991, the helical tube was discovered and submitted to Nature, but I also sent the manuscript to Kroto — and to Millie! Why? Because I had read papers by Millie and thought they were very interesting. This was presented at the Richmond Symposium in Virginia. That was my first oral presentation of the carbon nanotubes. This was in October. And, yes, this was published in 1991. Above, you can see more of the details. 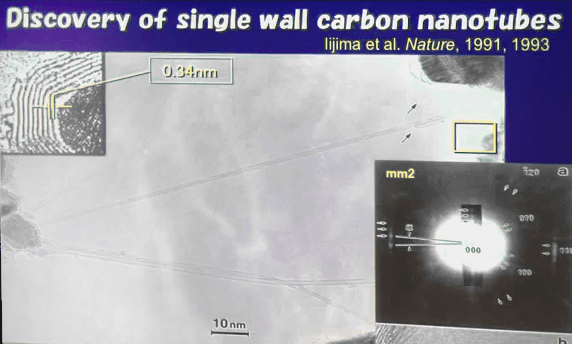 But we know that there’s no recipe to produce the single walled carbon nanotube! So it took us two years to create a single walled carbon nanotube. In fact, I found it accidentally. Of course, I followed up on that experiment, and then I had the electron diffraction pattern in more detail. That’s how I got the single walled carbon nanotube papers. As I’ve said, this had been observed years ago, so it’s a very interesting experience. Here, you can see the pictures and data I published in Nature on the single walled carbon nanotube. Note this electron diffraction pattern in the corner. 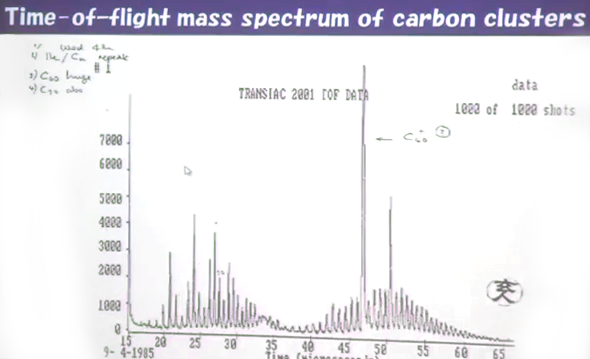 This diffraction pattern tells you how the carbon nanotubes are linked in a singular carbon nanotube. So that is very interesting. Now, when I published my paper, keep in mind that the idea of taking an electron diffraction pattern from a two nanometer material in an electron microscope — that was considered almost hopeless! 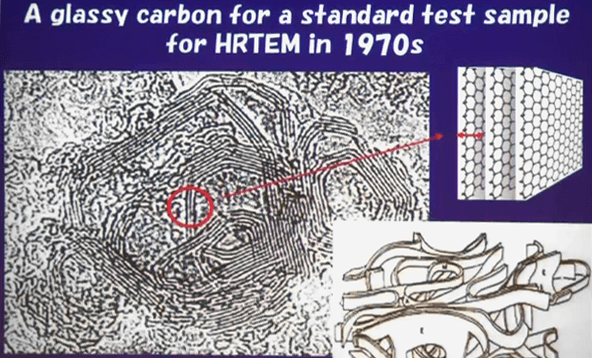 That’s why the knowledge about carbon electromicroscopy helped me a lot. Millie then did further research on nanotubes, and her group discovered that carbon nanotubes could be either semiconducting or metallic. That was also very interesting. Now, I come back to the Weizmann, again. This is 1996, and it was also my first visit to Israel. We had meeting on C60 — fullerenes. This was taken in Jerusalem. You can see Millie and Gene, here, looking much younger. On the left is Riichiro Saito, one of their Japanese collaborators. Actually, Saito wrote a number of very important papers with Millie on the properties of carbon nanotubes. Beside Saito is Reshef, and beside Gene is a French scientist from Paris, Christian Colliex — he’s also a microscopist. 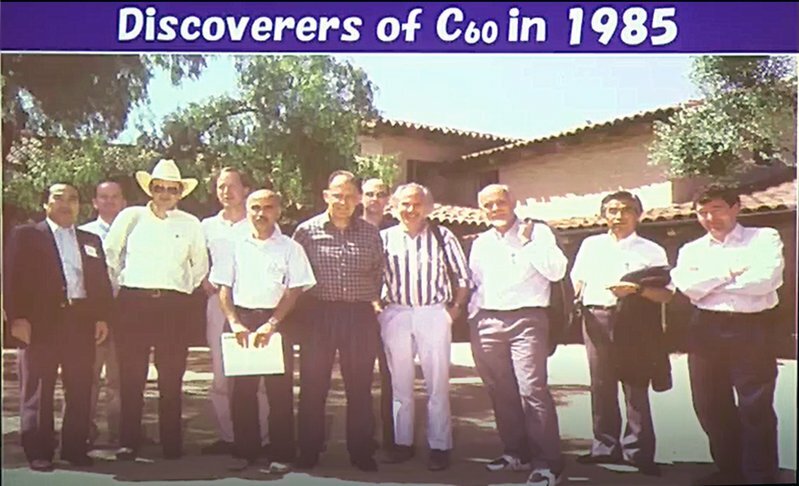 This was the 2nd international conference on Fullerenes in Jerusalem. The discovery was in 1991, so we had been acquainted for a number of years. 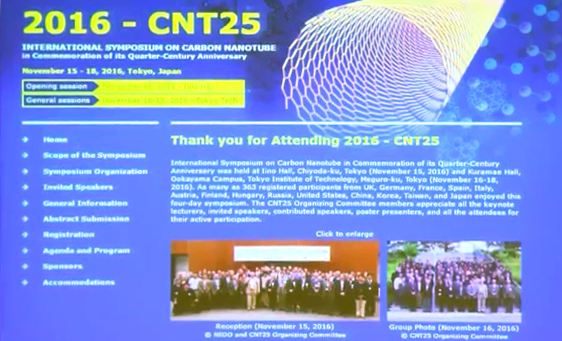 Last year, we had the 25 year anniversary of the discovery of carbon nanotubes. It was held in Tokyo. And, of course, Millie was invited. We were all hoping to have her at the meeting, but unfortunately, she couldn’t make it. 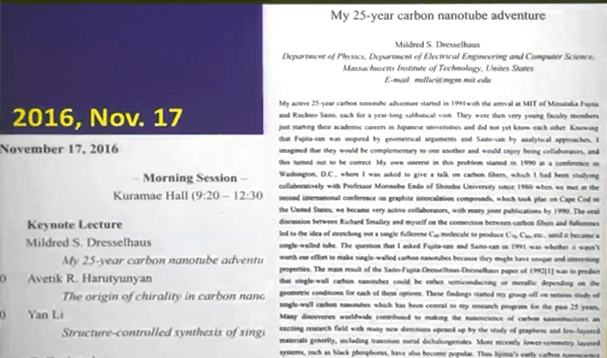 Above is my contribution: “Discovery of carbon nanotubes and beyond.” I talked about those things. This was supposed to be delivered last year in November. You can see her whole abstract. Briefly, she mentions about how she became involved with carbon nanotubes in late 1990, early 1991. See, that period of late 1990 through 1991 is a very interesting period for us. And probably some of you know what happened shortly before then. 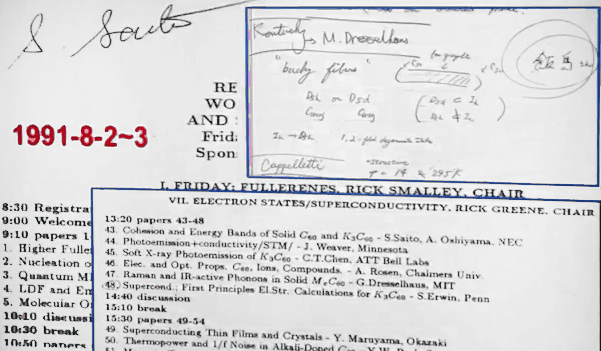 For instance, in 1987-88, high-Tc superconductivity was discovered! So this was a very interesting time to be in solid state physics. Now, to explain this, I should probably begin with a question: what was Millie doing in the early 1990’s? 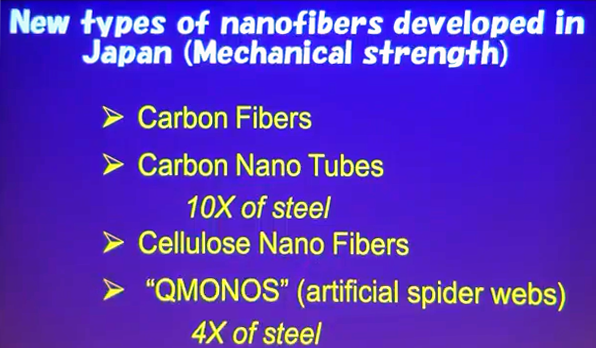 Apparently, Millie already came up with the idea of carbon nanotubes around 1991 — independently. Her idea was to start with C60. We know you can turn C60 into C70 by adding ten extra atoms around the middle. Add ten more, and you get C80. Then we can go higher — C90, C100, etc. Each one adds ten extra atoms around the circumference of the fullerene, stretching it out further and further, and if you do that enough times, you’ll get a tubule — in other words, a carbon nanotube. 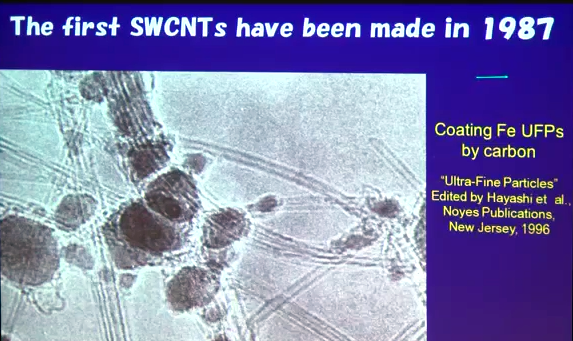 One story I know about Millie’s early talks on nanotubes comes from a colleague of mine, Dr. Saito, from NSE. I remember him telling me about a symposium in Philadelphia in August of 1991. Now, I didn’t go to this symposium. But I know the story, so I will tell it to you. On the slide above, you can see part of the program — and you can see that Millie was not supposed to be discussing carbon nanotubes; she was signed up to give a talk on magneto-transport of MX C60 film. 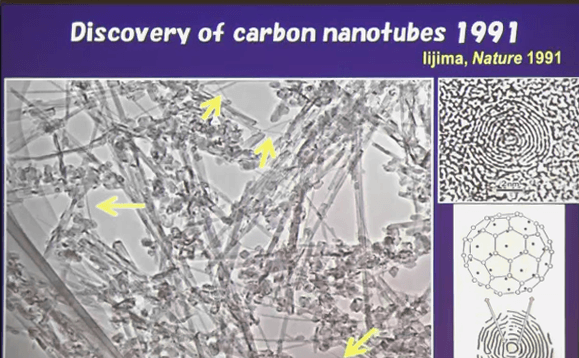 Millie gave an additional talk, all about carbon nanotubes, but it wasn’t formally written into the program. There’s a funny story behind this. One of Millie’s early students was Peter Eklund; by this time, he was a professor at the University of Kentucky. One of Eklund’s colleagues was supposed to present a paper at this symposium. However, he didn’t show up. At the very last minute, Millie was asked if she could improvise a talk off the top of her head. So Millie said, “Okay!” And she gave a talk about carbon nanotubes. That’s Saito’s memo. And you can see, Millie talks about them as “bucky fibers”, because she’s starting from buckyballs and stretching it out. So it’s a different approach than what I did. But it’s very interesting from a scientific point of view. And the timing of this talk she gave is pretty important. Here’s another photo. Reshef mentioned that we played chamber music together. Millie played violin — she was a great player and a great sight-reader. I was a beginner at that — so I had to practice a lot before I could play with her. But it was fun. 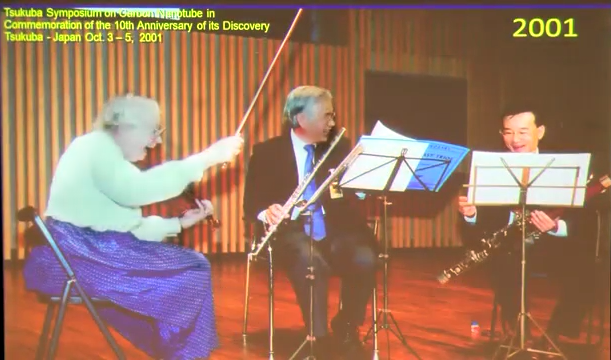 When I was not doing science, sometimes, I enjoyed doing this sort of thing — playing chamber music with Millie. This is my current research. First, making high tensile strength CNT ropes. Second, large 2D sheets of aligned SWCNTs. 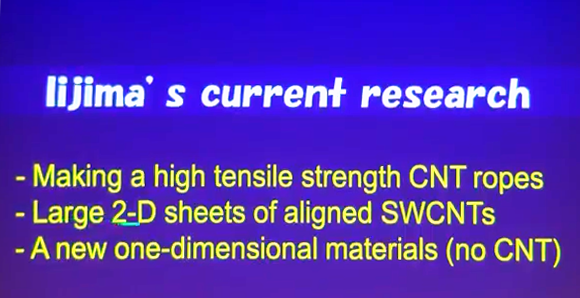 Third, new one-dimensional materials (no CNTs). I am interested in making strong fibers. In Japan, there are very big competitors to carbon technology. 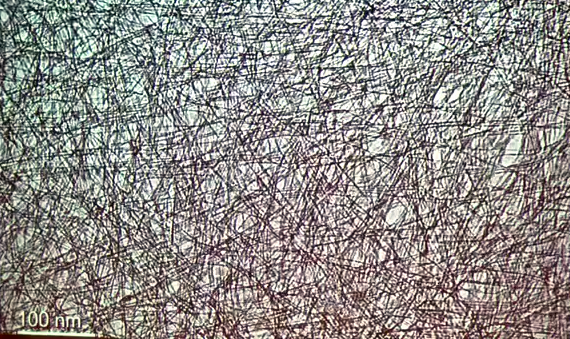 Cellulose nanofibers, for example. 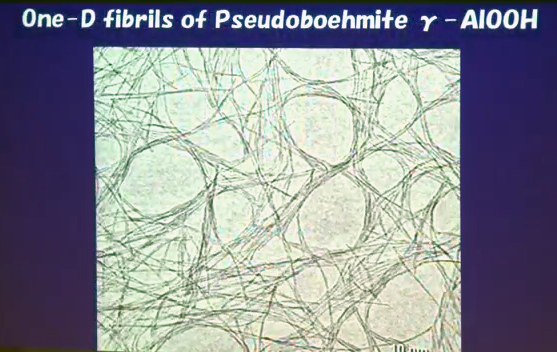 They manipulate some DNA and make massive organic fibers, now. The two of them appeared very recently. Then this one — my question is, what is it? A carbon nanotube? According to micrograph, the answer is no. This is not a carbon nanotube at all! It’s a different material. Above, that is a carbon nanotube. These are my very recent pictures. The magnification is almost the same. The separation is only 0.6 nanometers. What is this? The answer is in the title of the slide! 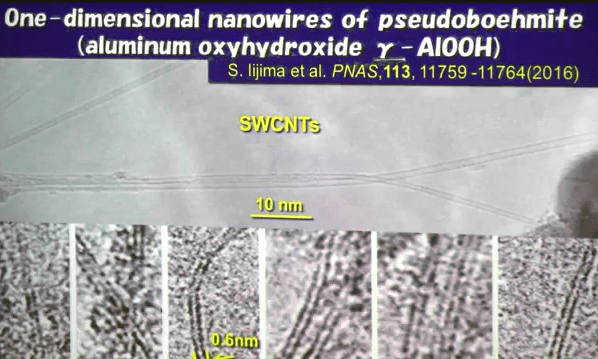 One dimensional nanowires of pseudoboehmite. This is aluminum oxyhydroxide. Gama-AIOOH. So this is oxide. I have been aware of this material for the last 20 years. I couldn’t figure out what was going on. But last year, I figured it out. I’m the first author on this paper. Boehmite is a very important industrial material, particularly in ceramics. Imogolite has a tubular structure. Kaolinite is similar to the layered silicate. By the way, when I was in Arizona, 40 years ago, I worked on a lot of silicate minerals. So I am familiar with all these pictures and with this material. Then I came back to this one, along the same lines — pseudoboehmite. 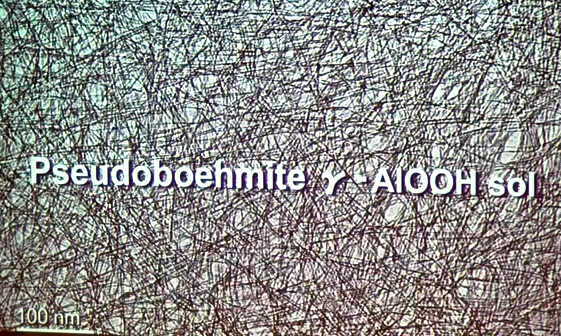 So the boehmite is the most difficult material to be studied by an electron microscope, because the moment you put the sample in water, it immediately decomposes! Ordinary miscroscopy cannot work on this material; except my group can do it! We spent 20 years figuring out how. Many people have tried this challenge, but gave up. We, however, were very motivated. The organic, tubular structures — you can find many, many of them in biological material structures. 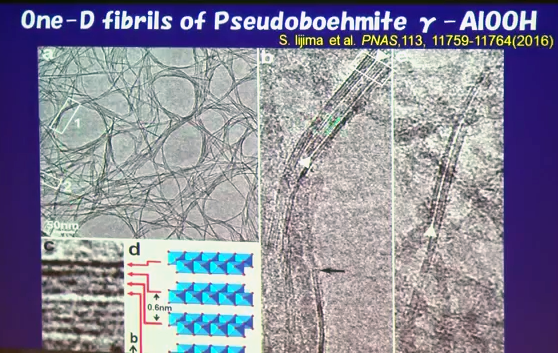 Flagellar, microtubule, tubular vesicular… I am aware of all of these different structures. And then, in inorganic, we have CNT, asbestos, and imogolite. I mentioned imogolite before — it’s the silicate. Remember? Let’s talk about the non-tubular. First, you have organic polymers, of course. And then there is pseudoboehmite — that’s a funny one. If you look at the low magnification pictures, it looks like it has a tubular structure, so I stuck to this idea for many years and tried to find a way to prove it. But finally, I gave up and realized they were not tubular structures. Why? Because tubular structures grow very quickly in an anisotropic way in terms of crystallography and crystal growth. So what do we do for that? 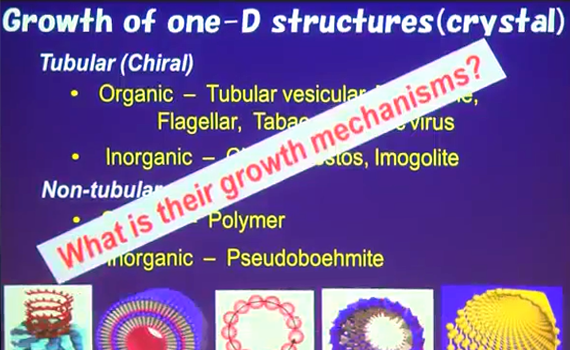 That’s why I am interested in all of these tubular structures in terms of chirality. Look at this. I still don’t understand why we have this structure. They are growing in the water. This is aqueous. SOL. Okay? The difficulty with crystallography is — that’s all you can get. Just that picture. 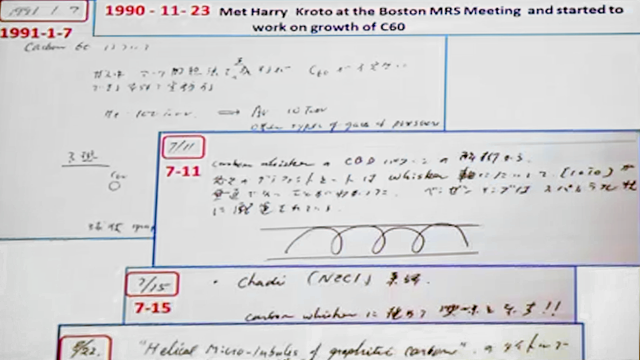 How could someone observe the detailed structure of this x-ray neutron diffraction data? That’s a good question. People don’t understand this material. …and here, you can begin to see the details. Notice the two lines corresponding to these two layers. 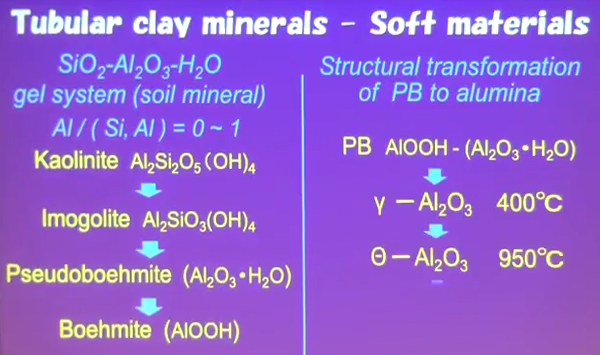 These layers are like Reshef’s material. It looks probably like it should have a closed structure, but they are never closed. This is the characterization of these structures. The actual real material is like this, surrounded by water. And then, some of the water comes in. So the separation is dependent on that. And of course, you know about hydrogen in the water, and you can see how it bonds in the slide above. To me, this is very interesting. I don’t think it has any applications, but it’s a curiosity that I want to solve. Yes. These are older pictures, but if you look carefully, you can see double layers. The majority are like that. But if I was clever enough, I could say they don’t have a tubular structure. If you have a tubular structure, it doesn’t matter how they are arranged, because you’ll always see this kind of structure. But here, that’s not the case at all. It does depend on how they are arranged. So finally, I decided my conclusion was that this has something to do with ribbons that are very short. That’s the answer. This is not just aluminum; it’s more than that. See, you can replace this with tungsten metal oxide, and the results are very interesting. People are still working on this. There’s some thoughts about titanium — what if titanium became 2D? Would it become a 2D semiconducting material? I hope to look into this because I think it’s interesting. Okay, this is my last picture. It’s a picture of Millie, and I believe it’s her at the White House. So to Millie up in heaven, I send you the following message: congratulations for the Benjamin Franklin in 2017! Please rest in peace. With that, I finish my talk. Thank you very much for your patience.